What is the basis for fallacy? Collect and categorize fallacies. Study and explain the cognitive biases of Systems 1 and 2. Understand how a Turing machine tape can be represented by two stacks for left and right. Wikipedia: Logic - A study of the form of argumentation, as opposed to the content. Thus logic considers general aspects of argumentation. There are only countably many computable programs, and so there are uncountably many nonenumerable sets. But in what sense are these a fiction? Show that any other mindset will also be in the same situation, but one such mindset (God's mindset) can simulate the situation of any other mindset. And those mindsets can simulate God's mindset. Thus consider our relationship with a Universally Superior Constructive Mindset. Jiri Raclavsky - Frege, Tichy - Two-dimensional conception of inference. Inference rules operate on derivations. Go from one truth to another truth, not from one assumption to another assumption. Ioannis Vandoulakis Logic social process - prover and interpreters (can be teams of agents). Each agent is autonomous. Each agent has its own history, record. Agents may follow different logics of reasoning. Understanding is a semiotic morphism across semiotic spaces. Three levels of logic: philosophers, logicians, mathematicians. Analogical reasoning is creative and useful when logical reasoning does not apply. Category theory approach: Given objects A and B, choose a morphism F from A to B. Then have a functor M that takes A to M(A) and B to M(B). Then consider whether M(F) goes from M(A) to M(B)? That is, consider, whether M is a functor. Geometric proportion (division), arithmetic proportion (subtraction) - both used for derivatives. Also, harmonic proportion. Central executive networks (rational, logic, reasoning, planning, response inhibition, problem solving, abtracting, organization). Default mode takes over in old age. Right brain - big picture, episodic memory. Cutting corpus callosum - split brain. Feel normal. Amygdala - Danger center, negative emotions. Helps to make meaning before signal enters sensory cortex. Creates ideas. Gets ideas from direct experience. Monitoring the situation. Is reduced upon verbalizing, naming the danger (formulating an expectation - so no fright or disgust). (So amygdala notes the inability to formulate an expectation). Example of embodied cognition. The body has an affect on the mind and interpretation. Movement and its importance. Systems mediated by dopamine (chasing the reward - suspense). Amygdala indicates if an expectation can be made. Expectations are propositions. Thus we see the source of propositions - the rational mind conceptualizes in terms of propositions - and we see where they enter, and how the emotions tell us if they are sufficient or insufficient (fright, disgust), and if they are satisfied or not satisfied (surprised, sad). Neo-Pythagorean thinking - generating infinite families - with pebbles. No proof is needed - just step-by-step verification - thus we have verification procedures. Non axiomatic. Verification by construction and inspection. Triangles, pyramids, but no cones. Pythagoras and Parmenides have no negative statements. For Parmenides statements are either meaningful (true) or not meaningful (false). Parmenides's semantic viewpoint: Key concepts: that which is (to eon) and thought (noema). True is expressible. Susieti žaidimų gramatiką su jausmų teorija. Įvardiję lūkestį, nepajusime baimės, nė bjauresio. O ką reiškia įvardyti žmogų? Jį galime mąstyti sąmoningai. Programs deal with components of objects, thus they are algebraic, an algebra. Programs change one variable state to another. These are mappings. Thus algebras of functions. Superposition. Naming of a variable allows diassociation of scope. Contextual understanding. The opposite is compositional semantics, which allows not to worry about the context. Integers - counting - ever introducing a new "pebble". Update - based on limitation of resources. Natural numbers - based on being able to introduce ever new item - in some dimension. Both are needed for computation. Propositions (expectations) create the distinctions (and duality) between truth and falsehood. Amygdala related to uncertainty, related to entropy. Brain wave synchronization linked to creativity. Ambiguity makes for freedom. Alzheimer's is a decrease in synchronization. The emotional system prompts a reading of it which gives a holistic reassessment of the satsifactoriness of our logical system. And also moods can give us a simulation that tests our logical system, especially when our logical system starts to depend on our emotions and tries to game them. Our self is what obeys our logical system and the world is what is beyond it. Algorithmic algebra. On any domains. Add Floyd-Hoare assertions, can go from programs to predicates, and so get Program specification algebra. Get a threefold mode: Quasiary predicates, quasiary functions, programs. 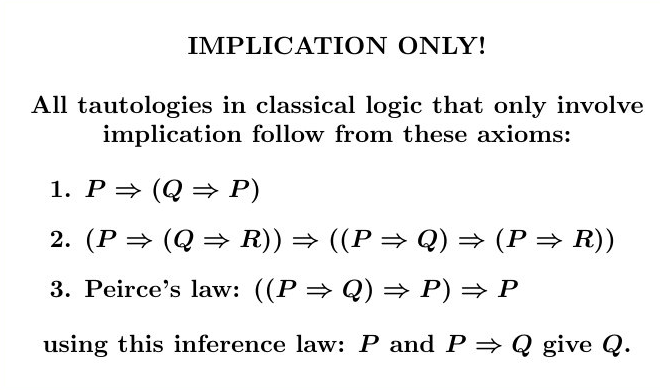 (Semantic) consequence relation vs. inference relation. Logical systems - class of algebras considered as program models; ...? ; interpretations; consequence relation; inference relation. Classical logic of n-ary functions. Instead of n-ary functions consider quasiary functions, yielding neoclassical logic. Next level abstraction is for hierarchical (nominative) data such as arrays - logic of nominative data. Concepts are the products (outcomes) developed by games. Topics/Comments vs. Subjects/Predicates. Concepts are subjects/topics, what you ask questions about, and comments/predicates/propositions are the answers. How are questions related to perspectives? Then you can ask questions about the questions (syntax) or ask questions directly (semantics). What is the difference between subject/predicate and topic/comment distinctions? Perhaps there are two different types of "about". A predicate is not a self-standing statement, but requires a subject. Whereas a comment is a self-standing statement without the topic. All concepts are tentative, conventional, contingent, secondary - we're actually interested in something else - so what we should focus on. Kevin Scharp - Replacing truth. Truth is best understood as an inconsistent concept. Concepts as exemplars, prototypes and theories. Extensive definition, intensive definition. Michel Serfati. La revolution symbolique. Jean Louis Maxime van Heijenoort. From Trotsky to Goedel. Turnstile: Content stroke and judgment stroke. Dasarathy sensory fusion. What is the minimum number of sensors to recognize any object? Jerzy Tomasik. Carnap: Semantic (truth) vs. Syntax (proof). Better is: model theory (truth) vs. proof theory (proof). Model theory makes the sevensome meaningful. It distinguishes between True and NotFalse, NotTrue and False, etc. Wittgenstein Notes 1930-1932, his most clear writing. Logical square: Exist good, exist bad imply there exists, thus not empty. Thus not a true implication - negation acknowledges the nonemptiness of a system. Bourbaki: three fundamental structures: Order (sequence? ), Topology (network), Algebra (hierarchy) - based on the structure of the real numbers. And then cross structures. If we restructured a sequence with a sequence, then that second structure would behave like a tree or a network. Likewise for the other restructurings. Relate the axioms of set theory with logic. David Corfield: Towards a Philosophy of Real Mathematics. Adjoints? x < Delta(epsilon), then f(x) < epsilon. Test (question) and state (probability distribution). Probability. Tensor product - f while g (network?). Composition - f after g (sequential) Circuits built from tensors and compositions. Strict normal monoidal category. Tensor product related to pullback? Trace (AB) = Trace (BA). Bell state and adjoint - combined give a trace. Transpose implicit in the wire yank. Circuits - symmetric categories. Diagrams - monoidal categories. Classical system - single wire. Quantum system - double wire. Complex number times its conjugate gives a real. Relate Clifford algebras and the slack in string diagrams. Basel Hiley - slack, collaborator of Bohm. The Undivided Universe. John Baez - quaternionic string diagrams. Two readings - organization? and implementation. B Coecke. Categories for the practising physicist. Observation disentangles what is entangled. We live in a countable disentangled world embedded in an entangled uncountable world. Probability describes the disconnect between the primary and secondary structure. This could be the basis for noncountability. Whether - empty set (or not); What - range of function; How - domain of function; Why - infinity. Emotion and Meaning in Music - Leonard Meyer. Page 31 - expectation activation, inhibition. Huron. Sweet anticipation. Double response. System 1 and 2. Musicians play with our tendency to overreact. Adjointness - enforcing rules vs. creativity. Series A (subjective) and Series B (objective) time - example of music using both. Linguistics uses both - see aspect. Tuščioje sistemoje nėra 1 ir 0, tiesos ir netiesos. Perturbation (as in real valued logic) can be modeled by the possibility that a system is not empty. Semantic truth (statement truth calculated from truth tables) matches syntactic truth (statements generated from algorithms). Combinatory logic. Developed by Haskell Curry. Related to currying? Book: Combinatory Logic, 1972. Emotions: naming allows not worrying. Dominique - logic is a sketch - presentation for category with limits. Verifying (NP) and solving (P) problems - compare with using variables to create problems (by adding information) and to solve problems (by removing information). There is one master function which computes all of the computable functions. So study only that one master function. And so we have a dual set of chains in terms of existence and universality but they are off by a half level so we have to think in terms of both chains, which is why we need the sevensome. Math variables create problems - in math, both sides are equal (commutative equality) - we have state equality. Computer variables solve problems - the two sides are not equal (noncommutative) - because we are setting the values. Nondeterministic methods are needed for the P vs. NP proof. My symmetric functions of the eigenvalues of a matrix can be considered such a nondeterministic method. Consider the various P vs. NP problems, what they say about a generic matrix and its eigenvalues. And consider the problem of determining whether two matrices have the same eigenvalues. And recall my combinatorial interpretation of K-1K and whether a monoid can be factored. K-1K - the inverse matrix - is the complement world. Aštuonerybė sieja algebra ir analizę žinojimo rūmuose, pirm sistemos. Reikėtų bene apversti brėžinį. Mat, algebra remiasi tuščia aibe - vienu lapu sprendimams - o analizė remiasi begaline seka lapų. Ar ta begalinė seka tiek pirmyn, tiek atgal? Ar jinai dvilypė ar ne? Aplinkos aplinka yra sistema. Delineating yra sistemoje ir pirm-sistemos yra jo aplinka. Tad sistema ir pirm-sistemos turi po 12 narių ir vienas kitą papildo. Turing paper of 1936 on the diagonal argument. Definition of logic duality: known and unknown. That is the basis of evoltion. Define music as purely syntactic. Four levels. Žodis "katė" išverčia pasaulį ir protą. => Katė yra pasaulyje ir jos sąvoke prote. Bet žodis "katė" ištartas pasaulyje ir ji atstovauja katės sąvoką. Palyginti su požiūrių grandine. Paskutiniame lygmenyje iškyla bendro tikslo (joint intentionality) galimybė, nes yra bendra sąvoka. Gali būti teiginys apie kates. Dviprasmiškumas - ar taip mąsto vienas protas ar visi protai. What is a statement of noncontradiction? Logical duality is very complete, universal, contrived, artificial, expensive, consequential. Shift from internally structured thing (whether/what) to external relationships (why/how). Syntax is conscious hierarchy, semantics is unconscious network, sequence relates them. But they all can model each other. Yet how? Outcome of game: single trial learning. Inside of game: multiple trial learning. And it is a matter of perspective. Abstraction is based on duality of variable and value. Double bookkeeping. Distance: Fourfold relation - how related ar they? Completely (a thing in itself) or separated (as a symbol). Abstraction is separation of symbol from thing and then working with the symbol (in a game). Symbol is object of joint intentionality. Ehrhart polynomial - triangulated polytopes. Ludewigs conductor Memel music school.